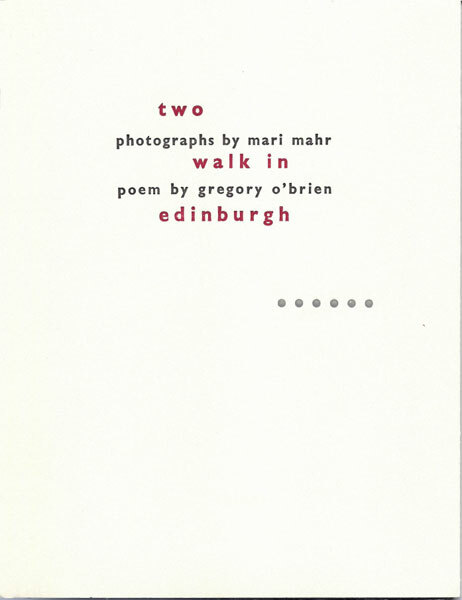 Two Walk in Edinburgh, photographs by Mari Mahr, poems by Gregory O’Brien, afterword by Jenny Bornholdt (The Holloway Press, 2011, $225.00); A Morning Walk in the Later Days, by Leonard Lambert (Cold Hub Press, 2010, $18.00); Devonport: A Diary/Esplanade, by Bill Direen (The Holloway Press, 2011, $100). No book is just a book: it is always framed by the occasion of its production. In the instance of the three books under consideration here, we have two books as objets d’art (Devonport and Two Walk in Edinburgh) and one chapbook (A Morning Walk). These two types of book are at the opposite ends of a continuum. The term ‘chapbook’ comes from those who once sold them: chapmen, hawkers of tracts, ballads and pamphlets. ‘Chap’ itself originates long ago in the Old English word for ‘barter’. 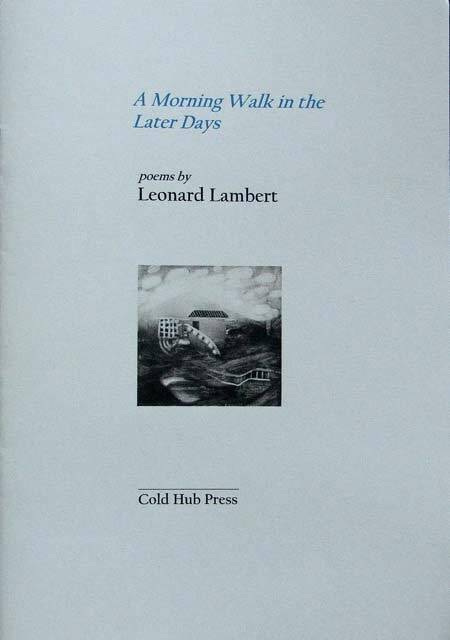 Leonard Lambert’s A Morning Walk in the Later Days belongs to a series of poetry chapbooks from Cold Hub Press in Governor’s Bay. The other two volumes are from Holloway Press and the material stakes and aesthetic values are at the high end of the market. Having myself created a book of writing plus photography (with Joanna Forsberg’s photos) for Holloway Press (The Fruits Of, in 2009), I’m not sure I should be commenting on another Holloway book of photos and writing, especially one that seems to do everything opposite to ours; this Mahr/O’Brien book being clear, logical, illustrative, descriptive, black and white, very much to-the-point. You read the poems, and you read the photos – or rather you scan the pages, as Vilem Flusser terms it, as if running your hands over them, as if scanning with two hands – in the manner of a Braille reader: one hand reading the structure of the image, and the other hand reading the observer’s intentions. As the observer in this instance, I must now reveal my intentions. When you read Gregory O’Brien’s poem and it says, ‘The hand contained but one/thought, the unopening window/another’ and the photo opposite contains a hand and a window and the next poem reads, ‘With its invisible hands and clock-like face’ and the photo opposite shows a disc like a clock face without hands and a single number (‘10’) on that face and the face is mounted on a building façade like a public clock might be, and so on, then you know you are in the realm of the symbolically illustrative: poem illustrates photo, photo illustrates poem, encoded meaning is doubly doubled. The problem with this is the redundancy. Nothing much is added by either component. The hope is that the partnership will create an intensification by repetition. Mahr’s photos, in themselves, already to some extent operate like intensification systems. They are curiously like stills from a Bergman movie from the 1950s (Winter Light or Wild Strawberries). There is not much composition of image, rather a literary placing of objects in the frame (a plaster hand, a sizing brush, an old book, a sunflower, or most Wild Strawberries-ish, a pocket watch slung round a stone pillar). All this in black and white only. These are images for decoding in a linear way: ‘What does the watch mean?’ the photo asks us. In her note at the end of the book, Jenny Bornholdt tells us what the watch means: ‘In this moment time is held.’ So we know, in that kind of way. Holloway Press produces beautiful books of a wide variety within the book-as-fine-art-object-in-itself type. This one feels exactly like that type of book should be, but not more than that. Leonard Lambert’s poems focus on coming to the end and looking back. It’s that moment in life when ‘the long ago’ is ‘oddly close.’ What the hell did father do about this moment? He tried to get his bearings: ‘My father was always putting up weather vanes.’ It is not hard to hear the vanity in this. Lambert’s poems sniff out vanity, as if he himself was that ‘greying dog’ he uses as an image of ‘winter’ (and it’s not really winter, it’s his approaching old age as if he were winter, and so the images circle back and bite their tails). In the poem called ‘Community Service’ he claims life is more a ‘sentence’ than a ‘gift’. Yet you get the sneaky feeling that he’s quite enjoying being here and noticing that it is like this. These poems are subject to their own usurpation. It surely is the hour of the final death-knell of World War II fathers, here and in Jeffrey Paparoa Holman’s book Fly Boy (Steele Roberts, 2010). But we should make a clean breast and confess that these small laments are for ourselves. It’s all a ‘swan-song of sorts’ as Lambert notices as he writes about remembering the Vulcan bomber flying over: ‘a small boy’s heart stood still.’ Dead then, and now soon to die. Rue the day. Maybe at such a moment there’s only loss to remember, but what can poetry do about this? That question is not taken up here and it might have made the poetry more alive, while there’s still time, if it had been. Ovid noted it all in the opening of his Metamorphoses, how the Golden Age gave way to the Silver, then the Bronze, and last the Iron, but immediately he went on to tell all those stories of transformation. Bill Direen’s diary of his time of holding the Michael King Writing Fellowship at the University of Auckland and living in the Signalman’s House on Mount Victoria, Devonport, which is part of the Michael King Centre, juggles with and meditates on the problems of the diary form itself; whether the quotidian should be filled with the marvellous or the mundane. He confronts the insects in the kitchen, and relates this sense of embattlement to living next to the naval base and on a hill with gun emplacements dating back to the imagined Russian invasion of New Zealand. He stands on the edge of the lapping tide and launches into a delightful diversion about the moon, the tides and the ‘principal lunar semidiurnal’. A short fiction, ‘Esplanade,’ is appended to the diary. Once again Joycean flourishes appear, this time as the call-girl approaches the Esplanade Hotel where B (the particle) waits. For Direen, like Beckett, French and English are his writing languages. Like Beckett, when asked whether he was English (and the same would apply if he were asked if he were French) he could reply: ‘Au contraire’. He is located here, in his diary. Enter your email address to subscribe to Landfall Review Online and receive notifications of new Reviews by email.